As previously reported, fiscal year (FY) 2020 discretionary spending is subject to austere caps that were put in place in 2011 as part of a larger effort to significantly reduce the size of the federal budget over 10 years. The Budget Control Act of 2011, or BCA, put in place caps on discretionary spending for both nondefense and defense spending for the period of 2013 through 2021. COSSA joined a letter with over 800 organizational signatures urging Congress to raise these spending caps. Congressional leaders are now considering several solutions to raise the discretionary spending caps and are currently taking part in high-level negotiations. Proposals include a possible comprehensive multi-year budget resolution, a less-restrictive “deeming resolution,” or legislation that would undo the budget cap requirements altogether. This most notable legislation, H.R. 2021, the Investing for the People Act of 2019, was introduced by Representative John Yarmuth (D-KY), Chair of the House Budget Committee, and would increase discretionary spending limits for the next two fiscal years. COSSA has also joined NDD United to support the passage of H.R. 2021. COSSA has also released an Action Alert for COSSA Members to communicate directly with their Members of Congress on the importance of raising the caps on non-defense discretionary spending. COSSA members are encouraged to sign up for the monthly Headlines webchat on March 14 at 2:00 pm Eastern, in which COSSA staff will recap the most important social and behavioral science news from the past month and answer participants’ questions. The March chat will feature a deep dive discussion with COSSA staff on the Trump Administration’s budget request for fiscal year (FY) 2020. Individuals employed by or affiliated with a COSSA member organization or university can register for the webchat here. The Trump Administration is planning to release its fiscal year (FY) 2020 Budget Request in batches over the next couple of weeks. 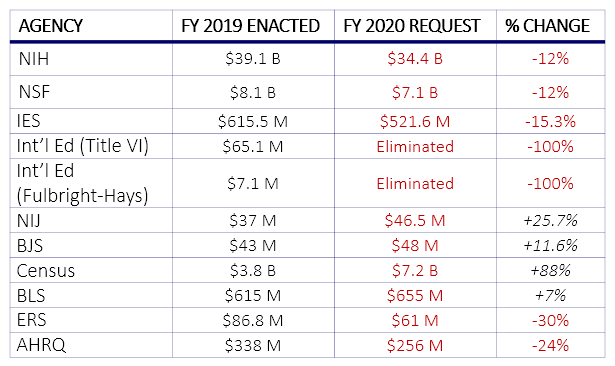 Due to the 35-day partial government shutdown and delayed ending to the FY 2019 appropriations process (see previous coverage), the President’s budget, which is supposed to be delivered to Congress in early February, is not expected until mid-March. Reports indicate that preliminary details will be released the week of March 11 with full details available the week of March 18. The research community is expecting another tough year for federal science agencies and programs, especially as the President has hinted at his plans to increase defense spending at the expense of non-defense discretionary spending, which includes federal research funding. As always, COSSA will prepare an in-depth analysis of the proposals for agencies and programs important to our community. It is important to note that the President’s budget is just that – a budget. Congress is not waiting for the President’s request to be delivered to begin their work on the annual appropriations bills. Oversight hearings are already beginning, and generally, the President’s request is expected to have little bearing on Congress’s funding deliberations.